&1. Water. Ready Mixed salt water is available at most aquarium stores and should always be kept on hand. Unlike freshwater tropical tanks, saltwater tanks cannot be filled with home treated tap water unless it is empty of fish. Saltwater needs time to be properly conditioned. 2. Lighting. 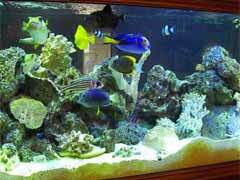 Proper lighting is important to a number of fish species and live aquarium plants. UV needs will depend on your fish’s needs. 3. Test Kits. A master saltwater test kit should also be one of you saltwater aquarium supplies. Get the one with liquid test droppers not paper strips. Liquid kits are less expensive over time and more accurate. 4. If you are looking for a very large tank, over 150 gallons, you may need to check out acrylic aquariums for sale. These are far stronger and less likely to crack. 5. Filters. There are a huge number of filters available for saltwater tanks. They type or types you’ll need will depend on your fish. All tanks need to be filtered. 6. Heating. Tropical fish come from tropical climates. This means warm and sunny. Tank heaters can be picked up at a saltwater aquarium supplies shop, and they should be used in all large tanks. 7. Net. Nets are the easiest and most humane way to move fish out of the tank cleanings or to quarantine sick fish quickly. Be sure to get one long enough to easily reach the bottom of the tank. 8. Conditioning solutions. These are necessary saltwater aquarium supplies need to maintain proper chemical and ph levels in your tank. 9. Tank Vac. An aquarium vacuum is the best way to clean the bottom of the tank and easily remove old water for changing. 10. Thermometer. I can’t emphasize enough how important these are for maintaining proper temperature. Should be used in conjunction with an adjustable tank heater.